Birthdays are a special occasion in our lives. We have built and entire tradition along it. It takes us to a new level of understanding, makes us feel older, mature, and happier and it also makes us understand that we are growing faster than we ever thought! It was one awesome year for me, and I’m excited about the next one! Each birthday I have this ritual to ponder over what I missed doing, my failures, my weakness and try to overcome each of those in the next time. 2012 was a year of accomplishments and a year of dreams coming true! I’ve turned 23. It’s the number of chromosome pairs we have in our DNA! Turning twenty three was something I was looking forward to! 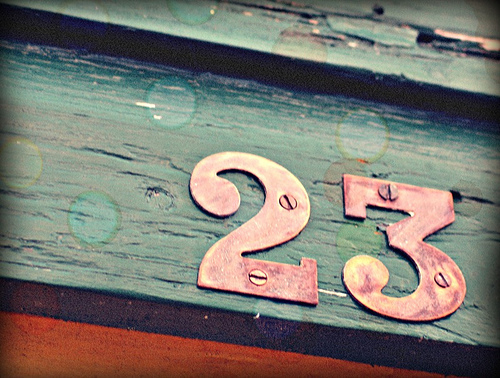 I’m not very fond of numbers, nor have faith in numerology, but 23 has been an important number of my life. Not just because I was born on that date, but because some important numbers of my life have 23 in them! My tenth grade board exams, the first biggest exam of my life, when everyone expected very least of me, I managed to succeed very well. The first person in my family to pass the board exams with a Distinction rank! 83.06 percent with 623 marks. I scored 823 marks in my first undergraduate year. It took me a total of 23 months to show off my biggest creation ever. My current cellphone number has 23 in it. So many examples, somehow the number 23 has its impact on my life greatly, and hence the excitement to turning 23 was huge. Turning 23 was a joyous adventure. Steve Jobs had quoted, “You can never join the dots looking forward; the dots connect only when you look backward.” Looking back is termed to be a losing attitude by most success coaches. But I tell you, you can only count your success and learn from your failures when you look back! But look back when you have reached somewhere and not while you are moving towards your goal. Turning 23 made me realize my dreams, took me places I never dreamt of and gave a reason to my life which is more concrete than ever. I feel blessed to have the people around me who support me in all I’ve been through and even in the lowest point have realized my worth and made me scale up the depths I’ve been into. Turning 23 was a journey of success. There have been a lot of failures in the life before, but this year turned those very failures into success. I had lost a year of college, one that was highly disturbing and unplanned time of my life, but it turned tables. The last year, was the year from being a 22 year old young entrepreneur to being a 23 year old researcher, innovator, scientist and a better human being. I made my very first trip to a foreign land, roamed France and Italy, saw two Wonders, Eiffel Tower and the Colloseum which was the part of my first international conference trip to Rome. Travelling thousands of miles on air and a trans-country trip in the beautiful railways of Europe and witnessing the breeze of the Atlantic Ocean have made their impact on the traveler spirit within me. Being the only Indian and the youngest in the conference was in itself a huge achievement for me. Sooner after my return was another conference in Pune, where I got to sit with people scientists from NASA on the same table, a moment never dreamt of! Two huge achievements in a matter of two months were more than I could ask for! Also, I have now almost finished my work on something called the ‘Batpod’ the first one in India and the 5th in the world! It isn’t boasting, it’s a testimony. Life can turn its path if we keep and trying if we keep moving inspite of all the failures and forces that keep us down. We aren’t meant to live the lives the world wants us to, we can be more, and we can be someone more than just another face in the crowd. I mean to tell you, we have the potential to be great. But greatness requires not just hard work but more importantly patience and perseverance. If we have those, we can be great. Turning Twenty Three was a tale of success for me. I’m more excited about what’s in store now that I’ll be living the 23rd year of my life. It’s the time to RISE. Deeshay Basara!